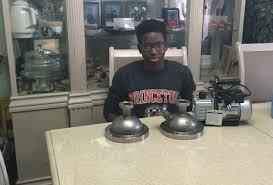 Nigerian teenager, Steven Udotong, who invented a nuclear energy fusor. Udotong, a 16-year-old high school junior in Southern New Jersey, in an interview on blavity.com, expressed the hope that his invention would inspire a cleaner, more environmentally-friendly future for all. To achieve the feat, Udotong created a GoFundMe page to raise 1,500 dollars for supplies, a goal he achieved in just one month. This past summer, Steven was accepted into Yale Young Global Scholar Programme, which allowed him to pursue the engineering workshop at the Singapore campus. He said that he realised he could be the first black student to build a nuclear reactor. The first part of Udotong’s invention was done but he still needed to raise money to complete it. He added that when he was done with that, he planned to enter it in science fairs and competitions for a chance to pursue scholarship opportunities.